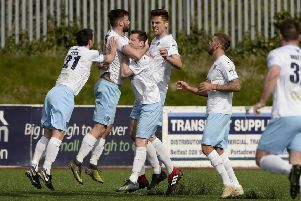 Ballymena United manager Glenn Ferguson admits Friday's home game against Carrick Rangers is a 'must-win' fixture for his side. Picture: Press Eye. Glenn Ferguson accepts that Ballymena United’s Danske Bank Premiership match with Carrick Rangers this Friday night is a “must win”. The Sky Blues are still searching for their first point of the league campaign as they welcome newly-promoted Rangers to the Showgrounds (7.45pm). Ferguson again came under fire from disgruntled supporters as United slumped to a forth successive defeat at Dungannon at the weekend but the manager insists: “I have to concentrate on what is happening on the pitch and try to turn that around. “The fans pay their money and they have the right to have their opinion and their say. “I give this job 120 per cent and will continue to do that. “The Carrick game is a must-win game, we know that. “If we work as hard in training as we did last week and approach the game the way we did against Dungannon I would be pretty confident we can get a result. “I still believe we have a good bunch of players but confidence is low at the minute and we’re trying to get as much out of them as possible. “Carrick will work their socks off in every single game because they have worked hard to get to the Premier League and they will want to stay there. “Every single game will be like a cup final for Carrick and we have to be ready for that. “We have to be ready for that and find a way to break them down and get ourselves up and running,” added Ferguson. The manager has summer signing Mark Magennis available following a carried-over suspension but the midfielder has been struggling with knee and calf injuries and may be short of match fitness. Defender Johnny Taylor (groin) and winger Neal Gawley (ankle) are due to resume training this week. * Don’t forget you can follow coverage of tonight’s match on our live feed NI Sport by clicking here.